How can I even begin to talk about David Mitchell’s The Bone Clocks? Touted as Mitchell’s most ambitious, most “Mitchell-esque” novel ever, this massive beauty of a book kept me enthralled for an entire weekend. I devoured this book, unable to put it down. I took it with me as my sister and I went around Toronto, lugging the 600+ pages just for the briefest snippets stolen on the subway, or the blissfully long wait for a movie to begin… and the weight was so worth it. First: major, major kudos to Peter Mendelsund and Oliver Munday for this beautiful cover. All respect for the UK cover, but this one has such ethereal beauty that I would encourage purchasing a copy just for the cover art (something that in the past, I’ve only really suggested for Chip Kidd covers). Then, the story itself is a series of layers that spans about a century, with all of the stories delicately, intricately intertwined. I wish I were more familiar with Mitchell’s body of work, as I’ve heard he includes a lot of characters from previous books in this story, and it would have been pretty mind-blowing to recognize them as they appeared. The story begins with fifteen-year-old Holly Sykes, who runs away from home after an argument with her mother. As a child, she used to hear what she called “the radio people,” mysterious figures who we barely understand till much later in the book. A psychologist “cures” Holly of these visions, but unfortunately, she can never truly escape. The story follows her journey, and the lives of the people she touches — a Cambridge scholarship boy, a war journalist unable to connect with his family, a middle-aged writer who goes too far in beating down his rival, and so on. Each of these figures narrates a section of the story, and each of them encounters “the radio people,” at times with horrifying results. The story reminds me of Stephen King’s books, with its creepy, surreal feel, and also of Kate Atkinson’s Life After Life in its epic sweep yet intimate tone. 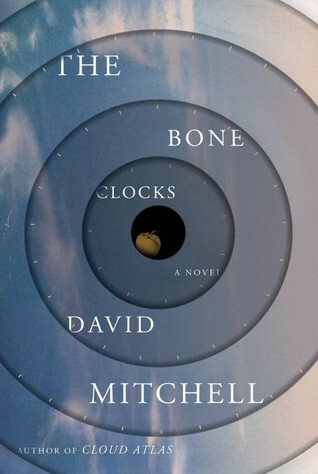 While I felt that Atkinson’s Life After Life fell short of its promise, Mitchell holds the narrative together well, and I found The Bone Clocks to be a much better constructed book. The book jacket describes the novel as “kaleidoscopic” and that’s a great way to describe it. Every time I felt like I was just beginning to grasp the story, something else happens, and it always felt like I was just glancing off the edge of what the story was really about. Around three quarters of the way into the novel, we finally learn what the mysterious radio people are about, and the story settles pretty firmly into supernatural thriller mode. We learn about an age old battle between good and evil, with Holly and the other characters merely innocent pawns. I was expecting the stakes to be somewhat higher and the battle to be somewhat more epic, but I still love how all the threads came together, especially the significance of the image on the US cover. My only real disappointment with this book was the final section. I’m sure Mitchell had his reasons for extending the story that far into the future, but after such a fantastical, epic, sweeping narrative in the previous sections, this one just felt like a letdown. It was a return to a feeling of reality, and a way to tie up remaining loose ends, and I just felt about it like I did about the epilogue of Harry Potter. Still, overall, a beautiful, fantastic story. I love David Mitchell’s Ghostwritten, number9dream and Thousand Autumns of Jacob de Zoet — a wide range of stories that demonstrates how versatile this author is. 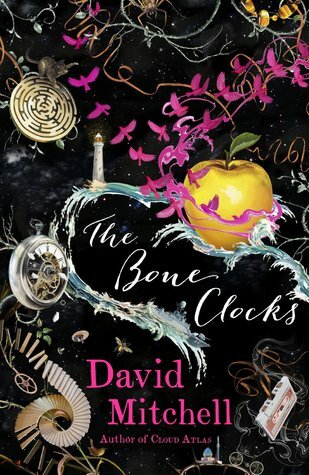 The Bone Clocks, by many accounts, is his most ambitious yet, and in true David Mitchell form, he pulls it off with flair. This entry was posted in Book Reviews and tagged 50BookPledge2014, Fantasy, Fiction, Horror, Mystery, Random House, Science Fiction by Jaclyn. Bookmark the permalink. I’m working my way through this right now and just loving it. David Mitchell is easily one my favourite writers.